House Republicans talk on May 12, the last day of the legislative session. Missouri lawmakers still don’t have an agreement on how to restore in-home health care services for more than 8,000 low-income residents. A largely ceremonial attempt to override Greitens’ veto fell way short in September. Since then, lawmakers have been negotiating about having a special session around the issue. But Rep. David Wood, R-Versailles, said time is running out. Republicans want to reduce a tax break, commonly known as the circuit breaker, for elderly renters and homeowners as a way to pay for restored in-home health care services. Democratic lawmakers, like Rep. Peter Merideth of St. Louis, oppose that idea. “If we just took 1 percent of the timely filing (discount), that would be enough money to restore (in-home) cuts,” said Rep. Crystal Quade, D-Springfield. Another suggestion floated by Democrats and shot down by Republicans would have required the state to begin collecting sales taxes for online purchases. Rep. Justin Alferman, R-Hermann, said last week on St. Louis Public Radio's Politically Speaking podcast that Greitens would likely not call a special session on in-home health care unless lawmakers agreed to a plan before returning to Jefferson City. Gov. 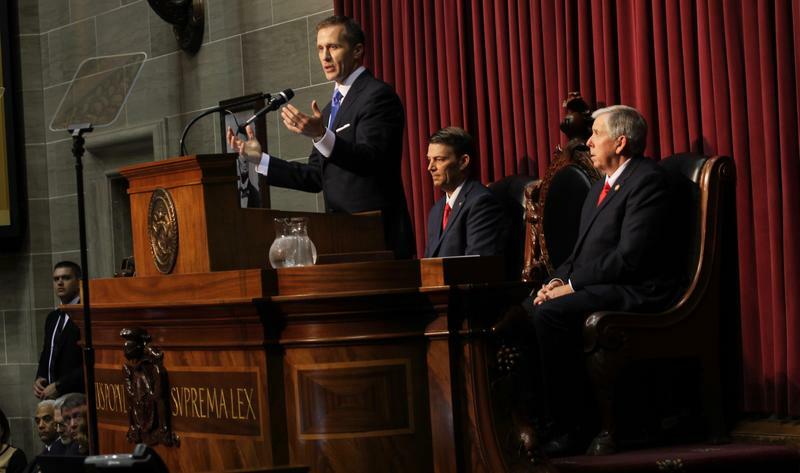 Eric Greitens used his first State of the State address to offer up a fairly conservative policy agenda, a slate of proposals that will likely find favor with Republicans who dominate the Missouri General Assembly.